EQUiSat solar panels are made in-house with scrap Gallium-Arsenide cells using a documented, repeatable production process. These panels cost 35 times less than the off-the-shelf panel and have 80% the power output. Each panel has a photodiode and IR sensor to help determine the orientation of the satellite. Although we had originally designed our satellite with TASC cells, during development the manufacturer went out of business. As a compromise, we have decided to use TrisolX cells on our side panels and TASC cells on our top panels. Although TrisolX’s cells are of similar effeciency, their shape requires a more complex arrangement. The current design for a side panel calls for 4 cells in series with 6 in parallel for a total of 24 cells. 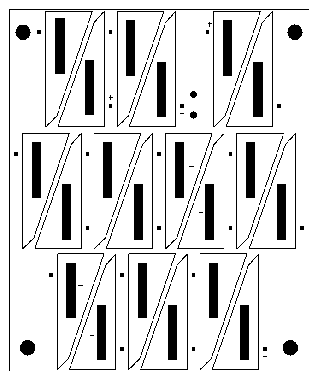 The top panel design calls for 4 in series and 6 in parallel for a total of 24 cells. This configuration was chosen to best match the nominal voltage of our battery packs. One of the most important parts of construction is achieving such a high packing factor while ensuring that the cells do not touch one another (and result in a short). The placement template is a piece of acrylic or masonite which was cut using a Universal Laser Cutter. In the future these templates could potentially be made using rapid-prototyping in order to maintain the desired accuracy while minimizing costs. During assembly, a solar cell can be placed in the cutout rectangle and pressed against the wall to ensure correct placement. The plans for the template were made by creating an Adobe Illustrator file using measurements taken from the PCB design software. The template is aligned with the PCB by sliding a dowel pin through the mounting holes in the PCB which have matching holes on the top placement template. Printed circuit boards have numerous advantages, the first of which is that they not only become the physical connection between the solar cells and the chassis but they also provide the electrical connection between cells which cut down on excess wiring that would be very difficult without professional processes. The boards can also be produced in quantity for cheap prices and high precision using online vendors. When placing and arranging these cell rectangles on the PCB, multiple considerations were taken into account. The maximum packing factor was desired to convert the maximum energy possible, but was limited due to a few conditions. Due to the manual construction process, some safety factor had to be maintained between the cells in order to prevent accidental shorting due to human error. Also, the batteries’ maximum voltage is 6.6V so the panels needed to provide a voltage greater than that in order to be useful. Mounting holes were placed on each of the corners to secure the PCB to the chassis. We used Cadsoft EAGLE PCB Design Software to make our PCB designs. Two easy to use mediums exist to electrically and physically connect the solar cells to the PCB, solder paste and conductive epoxy. Solder paste is placed between two metal surfaces, such as between a solar cell and a PCB pad and then paste is heated with a rework tool to secure the connection. Conductive epoxy on the other hand is an adhesive which usually contains silver. Epoxy comes in two tubes, resin and hardener, and when combined it begins to cure and eventually solidifies. The epoxy found to suit these purposes is Epoxy Technology’s EPO-TEK H20E Electrically Conductive Silver Epoxy. There are distinct trade-offs with regard to the use of both of these setting materials. After careful consideration, we have chosen to continue producing panels with solder paste. We found that the cells could be damaged by the high heat of a reworking tool and the two part epoxy provided the strongest mechanical connection. Our solar panels will be coated in a conformal epoxy layer before launch in an attempt to eliminate any physical damage to the solar cells, their connections, and the panels themselves during launch or handling. We will be using a clear silicone epoxy provided by NuSil for our conformal coating. One of the challenges in working with the conformal coating is eliminating air bubbles during the application process. In the vacuum of space, these bubbles would expand and burst leading to a phenomenon known as outgassing. The bursting could damage the panels and the ejecta could end up covering a critical part of the satellite such as the LEDs. In order to ensure a practical and repeatable process, we manufactured custom molds for both the top and side panels. These molds were machined out of blocks of aluminum and had holes for the wires and IR sensors. To apply the conformal coating, first mix equal parts of the two components. After carefully pouring the epoxy on the panel, which is sitting in the mold, we left the mold in a vacuum for up to two hours. This allows us to remove the majority of the air pockets that we created in the mixing and pouring process. The remainder of the bubbles can be manually popped using a safety pin. Once all the air bubbles have been removed, we baked the mold for 15 minutes at precisely 150℃. Once the mold cooled we carefully pried the panel out. Our power system contains a primary set of 4 LiFePO4 batteries that will manage the flash system power and energy requirements, while another set of 2 Li-ion batteries will handle the radio and microprocessor power needs. Recent developments in battery technology has expanded the range of different battery chemistries and lithium iron phosphate (LiFePO4) batteries represent some of these latest advances. This safer, less volatile chemistry can handle higher current loads, and more charging and discharging cycles. We chose the LiFePO4 option for our main battery due to the uniquely high current draw requirements of our LED system (Up to 60A). As a result, NASA selected EquiSat for launch because we are providing LiFePO4 batteries with the first opportunity to prove themselves in the harsh conditions of space. In the future, these batteries could be used on the next generation of spacesuits and rovers used to explore our solar system. This test will allow us to measure the depth of discharge and the lifetime of our batteries. This can be done using a relatively simple circuit that continually charges and discharges the batteries, using data acquisition and a relay switch. This data would potentially allow us to find a charge and discharge curve for our particular batteries. One of the more important sequences of testing will be when we test the solar panels and batteries in conjunction with the other subsystems of the satellite specifically the Flash and Electronics teams. Once the circuitry for the battery management system is completed by the Electronics team we will be able to run charge tests where our solar cells can charge both the Lithium Iron Phosphate batteries and the coin cell batteries. We can then run discharge tests with fully charged batteries and the Flash panel. These types of test will be the most important in ultimately determining the validity of our designs and give us important information of the cycling that our batteries will experience in orbit. Through Brown’s School of Engineering, we have access to a Solar Simulator Lamp, provided by Professor Pacifici. This lamp provides the power of a sun (100 W/m^2) that you cannot receive from a normal lightbulb. In addition, this machine can shift the wavelength of light to simulate being in space, which will be used for tests in the future. This lamp will be used to test the efficiency of our cells as well as our panels. The software of the solar simulator outputs our panel’s IV curves, which can be used to test our efficiency under different conditions, such as at an angle or at a higher temperature. 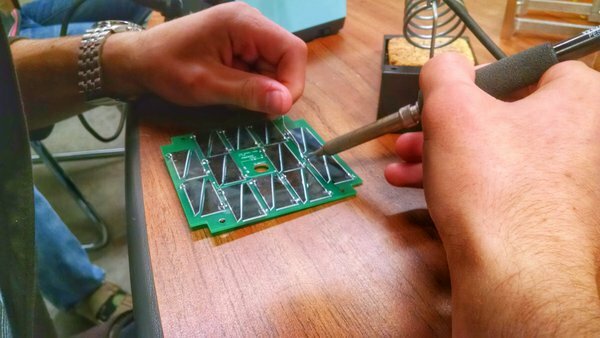 In order to ensure that the conformal coating is working properly, we are putting our coated panels through rigorous testing. A number of shock and thermal tests must be performed to ensure that the coating is protecting the cells mechanically and structurally. The thickness of the coating must also be optimized to reduce cost and weight but still provide enough support. We also use microscopes to closely inspect the panels throughout the testing. According to the Spectrolab data sheet for the TASC cells, the peak power voltage of an individual cell decreases by 6.2mV/ºC increase in temperature. This means, for example, that at 100ºC increase in temperature of the panels would decrease the open circuit voltage from 7.56V to 5.7V for the sets of three TASC cells in series. Similar tests will have to be performed for the TrisolX cells. EQUiSat provides verification for our unique power system, designed specifically for affordable, yet power intensive CubeSats. This is broken down into the validation of our in-house fabrication methods for solar panels as well as the use of LiFePO4 batteries in space applications. 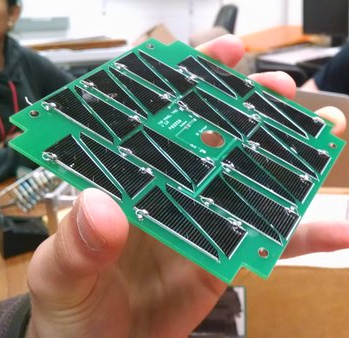 The size of EQUiSat’s solar panels is limited by the CubeSat architecture. We have optimized our panels for our own uses by making efficient, affordable panels which produce voltages at our desired range. In accordance with our primary mission of accessibility, it was important for us to minimize the use of pre-built, and often expensive CubeSat components, such as Clyde Space solar panels. We found that by using low-cost, Gallium Arsenide scrap cells from Spectrolab and TrisolX, we can reduce the cost of the solar panels by up to 35 times while maintaining their efficiency in comparison to prebuilt panels. In order to do so, we have developed, and are continuing to iterate, an intuitive fabrication process to make these solar panels from scratch. This process, which has already been utilized by other university satellite groups (such as the University of New Mexico) through the documentation on our website, can help amateurs effectively produce cost-efficient solar panels. Our chosen LiFePO4 batteries provide a number of unique benefits, and their success in space could expand the power capabilities of small satellites. A123 Systems LiFePO4 cells have high current draw capabilities, up to 30A continuously and 60A pulsed. This eliminates the need for large, electrolytic capacitors, which can be volatile in a vacuum environment. Their chemistry is generally more stable, and as a result, a safer option in comparison to other lithium-ion batteries. 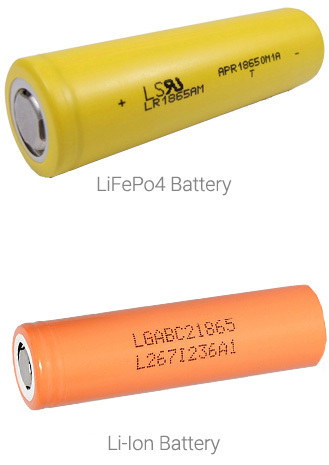 Given the problematic phenomenon of thermal runaway, observed in other batteries, the thermal stability of LiFePO4 batteries is promising. LiFePO4 batteries are stronger candidates for use in a space environment where temperatures are likely to increase to extremes near 70 ̊C. The eventual launch of the satellite requires the batteries to be tolerant to physical abuse caused by heavy vibrational loads. Testing conducted in precedent studies has shown that the batteries can be exposed to high magnitude vibrations and other physical stimulation without any noticeable effects to performance. CubeSat requirements also stipulate a mass budget for the satellite, and LiFePO4 batteries offer a lightweight solution for the power system when compared to other available battery options. Additional testing of these batteries is currently being conducted for applications in space at various NASA centers. The majority of this validation will take place in orbit as we monitor the power budget of our satellite and the health of our system. We will be able to send down this data via our radio to be processed at our ground stations. However, we have already begun the verification of these components on the ground. Through extensive testing in both normal and extreme conditions, we will reduce failure points and validate each component’s success in the space environment. The success of EQUiSat’s power system will set a precedent for the use of this new battery chemistry and the fabrication of space components, opening new opportunities for small satellites. Furthermore, power system failures are among the biggest causes for systemic failure in small satellites. 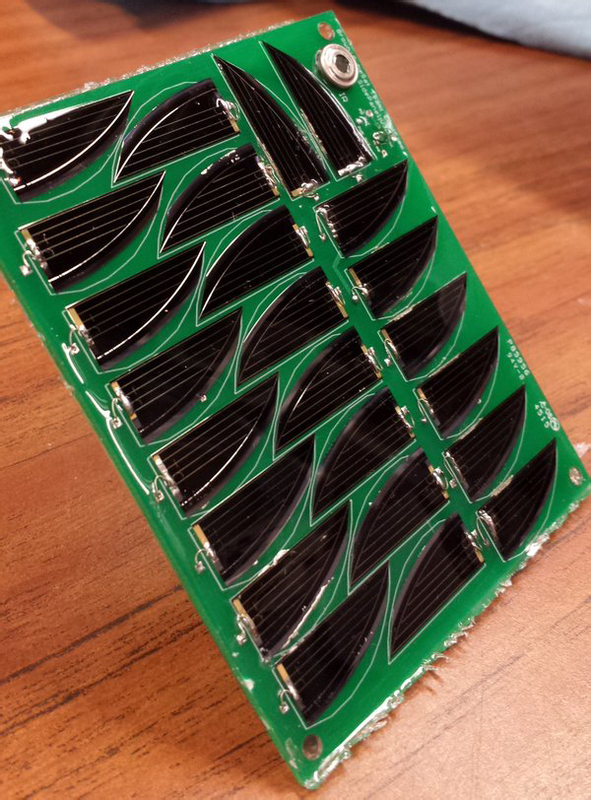 Our efforts to create a reliable, low cost, and simple power system that is capable of handling high power (over the typical high energy) requirements will be extremely beneficial to the CubeSat community.